Elebaires Spanish Language School > Blog > After school activities > Picada Fridays! Every Friday, we invite Elebaires students to a picada with friends, drinks, and traditional argentine foods. This is a great opportunity for all the students to get to know each other and exchange cultures. We have had students from Germany, Holland, Australia, Japon, Astonia, United States, Korea, Canada, England and more to share a meal and welcome the weekend with us! Before the weather turned chilly, we had the picadas in the park right in front of the Congresso building. However, as the winter months are approaching, we have moved the picada location to inside the school. This past week we ate empanadas of pollo, carne, cebolla y queso, jamon y queso, caprese, y verdura. These are all traditional flavors of Argentina and the students loved them! Out of 90 empanadas, there wasnt a single one left behind. 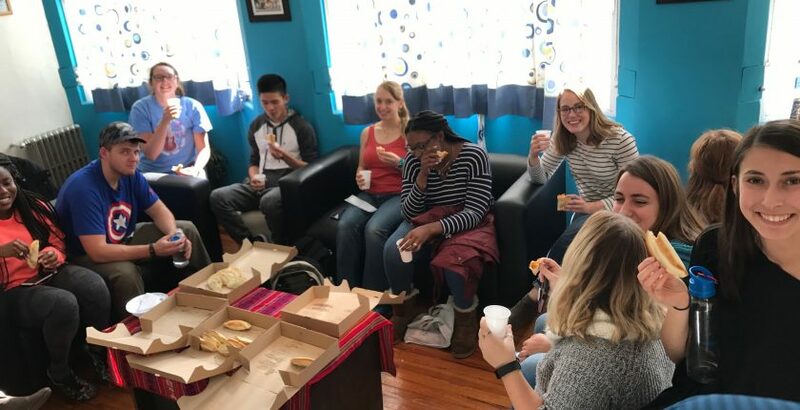 The students also enjoyed beer and wine as we sat together, listened to latin music, and practiced the language skills that we had learned that week. During past picadas, students have also enjoyed handmade argentine pizza, chori pan, and tortas. We hope to keep this tradition alive and are always looking forward to the next picada. We are eager to listen to any suggestions that the students might have for making each one even better than the last. Everyone is welcome to join the picada and start the weekend off right with Elebaires!